Fun with faux fur | Is This Mutton? I was thrilled to receive a faux fur stole for Christmas. It's ideal for draping over a shoulder and securing with a belt. Here I'm wearing it with a black jacket, black polo neck jumper, felted brooch of a Herdy (Herdwick sheep, found in the Lake District) and a grey skirt with asymetrical hem, plus my "mean" pointy black ankle boots. The scarf is the same colour, more or less, as my hair! Brown faux fur scarf, Marks & Spencer (out of stock), black polo neck, Next (past season); black MaxMara jacket, past season; Herdy brooch, Moor End Felts; boots, unknown (have had them for years). Skirt, Laura Ashley. I also tried the fur stole with a green jacket, brown trousers and gold boots - but I think it looks better with the black ensemble. Green jacket, Zara, past season; gold boots, Office; brown trousers, Marks and Spencer. 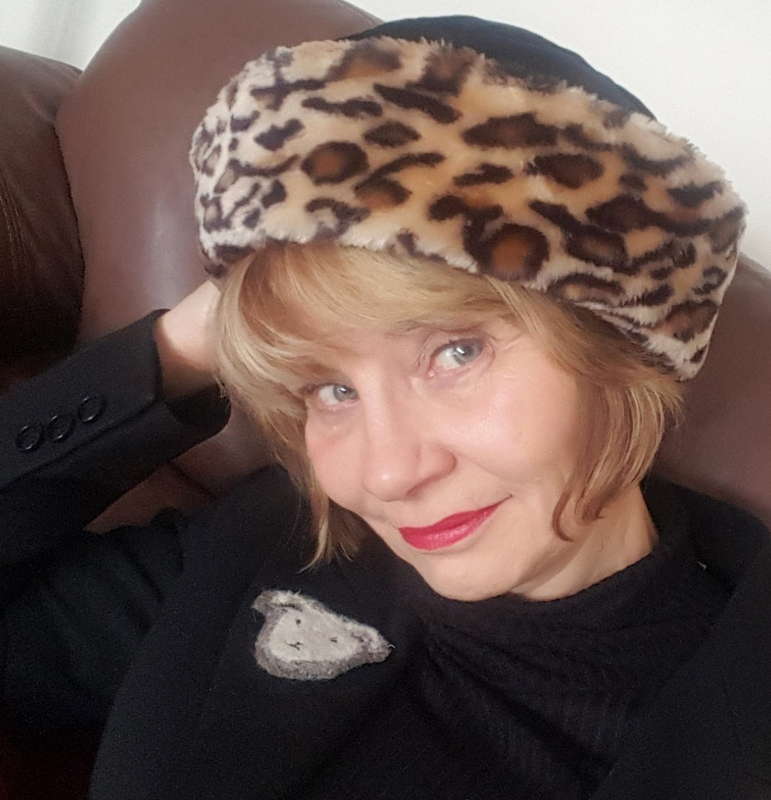 I love faux fur and this hat, bought when I lived in Munich in 2000/20001, is the only leopard print item I've ever owned. You get a nice close-up of Herdy too. I don't have many hats (why not?!) but I love the way Judith at Style Crone makes hats such a key part of her outfits and I was itching to join her Hat Attack link up, so here we are! What is your favourite faux fur buy, or your most memorable (good or bad?). Sharing this post with Style Crone, #HatAttack42 ; Style Me Wednesday at Shopping My Closet and #MyRefinedStyle hosted by NotDeadYetStyle. If you'd like to get an email notification about new posts, click on the Bloglovin box on the right. Come over to my Facebook page - you'll find some extras here. Oh, there is your kitty! I love the way you've belted over the fur stole - very elegant! : You look wonderful in hats and your leopard print hat is so stylish! Let 2017 be the year you bring more hats to your personal style! Thank you for sharing your headwear (and Herdy) with Hat Attack!